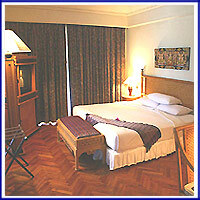 The Superior Suites offer, in addition, a spacious bathroom in marble, and spa bath, a cosy living room and balcony. There are the Executive Suites, Honeymoon Villa and Presidential Suites. And for those who prefer the great outdoors the Garden Bali Villas or Garden Rooms may be more to their taste. Of course round-the clock butler service is always at hand. You are then accompanied through cool corridors, past superb paintings and gracious statues, through quit fountain courtyards and Persian carpeted alcoves to your room which has a private balcony with vistas of gardens and the Indian Ocean beyond. Attention to detail is highligted - from the hand-crafted furniture to the designs etched on the glass and wood balcony doors, to the object d'art, and opulent bathrooms. An enchanting blend to delight our guests. Bali Cliff Resort offer 175 Guestrooms which range from Superior Rooms through a wide choice of luxurious Superior Suites, Honeymoon Suites, Royal Family Suites, Family Villas, and Presidential Suite.